Trying to understand the arc of the city that led to such projects as Atlantic Yards, I've been writing recently about the loss of manufacturing. 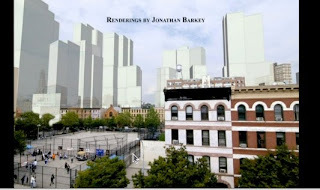 That's part of a larger story, told intriguingly--if incompletely--in the 55-minute 2010 documentary, The Vanishing City, by Fiore DiRosa and Jen Senko. Told through the eyes of tenants, city planners, business owners, scholars, and politicians, The Vanishing City exposes the real politic behind the alarming disappearance of New York’s beloved neighborhoods, the truth about its finance-dominated economy, and the myth of “inevitable change.” Artfully documented through interviews, hearings, demonstrations, and archival footage, the film takes a sober look at the city’s “luxury” policies and high-end development, the power role of the elite, and accusations of corruption surrounding land use and rezoning. The film also links New York trends to other global cities where multinational corporations continue to victimize the middle and working classes. Opening with the voices of neighborhood residents who fear they are being pushed out, the film pivots on the insights of anthropologist and urban historian Julian Brash, author of Bloomberg’s New York: Class and Governance in the Luxury City and subject of this 10/22/08 Q&A on Jeremiah's Vanishing New York blog. 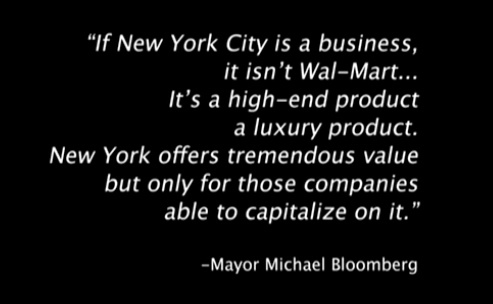 The "luxury city" quote, as noted at the bottom, reflects Mayor Mike Bloomberg's framing of the city as a luxury product for corporations to choose as a location--a philosophy, as the film points out, that's belied by the tax breaks targeted for big employers. But the film, not inappropriately, points to an emphasis on building luxury housing, with the attendant shift in the character of neighborhoods, as small businesses close. The question, echoed in the 2007 and 2008 discussions of Jane Jacobs and Robert Moses, is whether that was simply the market at work. As the film reminds us, it wasn't. Jonathan Bowles of the Center for an Urban Future and Bettina Damiani of Good Jobs New York criticize the "nonsensical policy" (in Bowles's words) for dangling tax break to corporations like J.P. Morgan, Goldman Sachs, and major media outlets, which distorts the tax system. Urban planning professor Tom Angotti observes that, in response to massive abandonment in the 1970s, the real estate industry "contrived a set of policies to subsidize reinvestment," which excluded people with low incomes, reduced public housing subsidies, and was keyed to the market. While it's true that major tax breaks were passed to encourage market-rate housing, an enormous amount of housing was reclaimed under the administration of Mayor Ed Koch, as author Jonathan Soffer writes. A key insight in the film comes from sociologist Saskia Sassen, who suggests city leaders in the 1970s were terrified of decline, "so they gave it away... It is less excusable that, later on, in the 1990s, when it was clear that there was a new type of economic growth, that they still were giving it away." This suggests some framing for the Atlantic Yards project, illustrated in the film with photo composites (right) by Jonathan Barkey. When, in 2003, the project was announced, should Brooklyn have been grateful for such presumed investment, as Borough President Marty Markowitz suggested, or should the city, state, and MTA have driven a hard bargain? 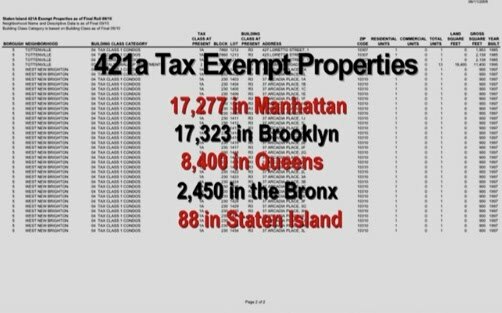 The film moves on to City Council Member and urban planner Brad Lander, who describes the 421-a tax break for housing, passed in 1970s and, by the 21st century, fueling an enormous amount of housing in Manhattan and, notably, Brooklyn. The value of the tax break tripled from 2001 to 2004, reaching half a billion dollars by 2006, he says. Historian and Manhattan Institute fellow Fred Siegel expands on the "luxury city" idea, noting that the increased growth, notably from the world's rich, would ride the financial boom and require the rezoning of manufacturing space for housing and retail. The city needs to ensure that growth takes place in the right places, declares a reasonable sounding Rohit Aggarwala, who led the PlaNYC program, pointing out that the rezonings aim to encourage greater density. But Andrew Berman of the Greenwich Village Society for Historic Preservation responds that such plans usually precede a bust, but wind up "being a way of facilitating completely out of scale development." Hinted at but not stressed in the film is the essential bypass of public input. Doris Diether, a zoning consultant, says the rezonings come from the city, not community voices. Indeed, the city has ignored the 197-a plans produced by some communities. We see City Council Member Tony Avella complain how the city bends the rule for developers--"people have to take it back from the developers." Still, Avella was an outlier in a city dominated by the mayor and a strong Council Speaker, Christine Quinn. We see Nellie Hester Bailey of the Harlem Tenants Council decry a rezoning aimed to increase luxury housing in Harlem, criticizing elected representatives for not caring about "the loss of 71 local businesses." Psychotherapist Christopher Murray observes that displacement has psychological effects: "it's a big deal to have to move from Harlem to Coney Island." True, but the question remains: to what extent should people be guaranteed a place in their community at or near the rent they long have paid? 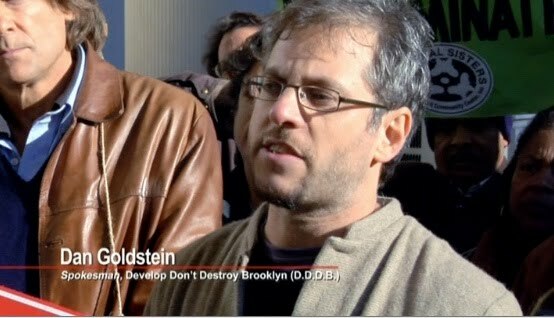 We see attorney Norman Siegel, who represented plaintiffs challenging eminent domain for the Columbia University, at a press conference offering a stemwinder: "No, no to eminent domain." Kent Barwick, former head of the Municipal Art Society (MAS), observes that "we think there should be a pretty clear showing there's a public benefit." That's a reasonable guideline, but the MAS notably steered clear of challenging eminent domain for Atlantic Yards. 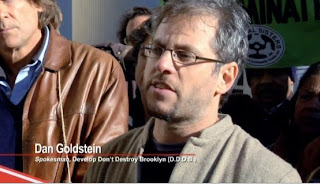 We see Develop Don't Destroy Brooklyn spokesman Dan Goldstein (right) decrying eminent domain abuse as a citywide problem. Brash suggests that the decision to turn gritty, under-serviced (but economically quite busy) Willets Point into a center for housing and conventions is driven by image of city as a luxury product. Willets Point property owner Jake Bono offers earthy incredulity, complaining that the plan was announced with no local consultation. "If you disenfranchise a population," observes Barwick, you can't blame people for being estranged. The film is perhaps on its firmest ground when it explores how property owners are trying to take advantage of the law to move rent-regulated housing to the market. One egregious case: owner-use eviction at 47 E. 3rd Street in Manhattan, in which the owner said he'd take all 15 apartments and combine them into one unit. Angotti decries short-term outlook of such investment funds. Many buildings were stalled or empty after the October 2008 financial crash, according to the film, though an up-to-the-minute update would present a more mixed picture, as unsold units saw prices slashed. Brash notes that fiscal crises seem to appear once a decade, and should lead to an effort to diversify the economy, since, when crises hit, finance does worse. In 1969, the film tells us, 40% of workforce worked in blue-collar jobs. Currently, that figure is less than 10% of workforce. So the city is increasingly dominated by extremes of wealth and low-wage service jobs. Unexplored is what the right percentage for blue-collar jobs might be. There are other technological and societal forces besides city policy that have lured manufacturing away. Sassen, who's studied cities around the world, suggests that today's inequality is different, as growth means the growth of high-income jobs, with concomitant low-income jobs. "When you have this distribution we see," she says, "the city itself is in trouble." The film closes in a bit of a muddle. One unidentified person says, not unreasonably, that the city needs development, but we don't want it at expense of character. The final frames, echoed by an ominous drumbeat, portray gleaming new buildings. In some other city, they might be lauded as signs of progress. Here, it's more problematic. "There needs to be kind of an oppositional understanding of New York that needs to become widespread," suggests Brash. Political action is not dead—it’s just not being articulated in a coherent way on a city-wide level. It’s hard to tell where a coherent alternative would emerge from right now. But it's hard to believe it will not. Assemblywoman Deborah Glick gets the closing words, suggesting that private profit is seen as contributing to the general good, while supports for working and middle class people are seen as an unaffordable entitlement. "We have to change that basic notion," she says. That's a broad statement about a complicated issue. Still, projects like Atlantic Yards are billed as supplying trickle-down benefits from private profit. But those calculations of new tax revenues have been based on very optimistic assumptions, so it's quite doubtful we'll get what was projected. Yet, if these and other cities are to sustain their momentum, they need to look beyond “the luxury city” and to the potential of less glamorous neighborhoods that can attract the middle class and people with families. ...But these communities can only grow if cities focus on those things critical to the middle class such as maintaining relatively low density work areas and shopping streets, new schools, and parks. This would require a massive shift in urban priorities away from the current course of subsidizing developers for luxury mega-developments, new museums, or performing arts centers. To maintain and nurture a middle class, cities need to look at the essentials that have made great cities in the past and could once again do so in the future. It’s clear that many traditional industries—heavy manufacturing, warehousing—as well as middle management white collar jobs will diminish in the future. But it is possible to imagine the rise of a new kind of urban economy built around people working in small firms, or independently in growing fields such as information, education, healthcare, and culture, or as specialists in a wide array of business services. 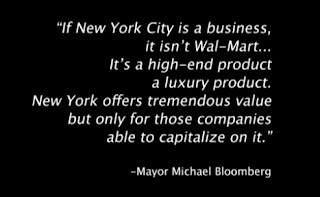 Taking aim at the notion that New York's high costs discourage business growth, Mayor Michael R. Bloomberg said yesterday that the city is a luxury product and that businesses should be willing to pay more to operate here. Addressing an audience of corporate, cultural, government and labor leaders attending an economic conference at Rockefeller University that was closed to the press, Mr. Bloomberg said the city needed to act like a private company and strengthen its brand to market itself better to those businesses that can afford it. Mr. Bloomberg's address signaled, in perhaps the starkest terms yet, his change from a man who thought higher taxes would ''destroy this city'' to one who sees the city he governs as a value-added commodity. The words underscored the direction in which Mr. Bloomberg has been moving as his administration struggles to find a way out of the city's fiscal crisis. Some of his positions -- raising taxes, specifically -- have been surprising, coming from a businessman and a nominal Republican. At the same time, he has also remade the mayoralty to reflect his style and the lessons learned through years in private business. Yesterday, both aspects were on full display. ''I've spent my career thinking about the strategies that institutions in the private sector should pursue, and the more I learn about this institution called New York City, the more I see the ways in which it needs to think like a private company,'' the speech draft reads. Mr. Bloomberg outlined a strategy to encourage economic development, saying the city needed to focus more on those companies that would pay extra for the unique advantages the city offers, as well as companies that can help the city, too. Thank you for this article; I found it very informative. I would like to add one thing that I think is important. In the past few years I have had many conversations with young people (say between 22 and 36) who have recently moved to the city from other parts of the country. Although they are friendly and eager to find out about the city, they show no interest in exploring the city's political landscape, many of them don't even re-register to vote here. They are oblivious to their role in the political world of the city---they have not examined or considered the mayor's vision of the "luxury city" or where they fit into it. As long as these folks remain uneducated and uninvolved, it will be harder to create a fairer environment for all. Great post, Norm. I saw "The Vanishing City" at the National Arts Club, in a program of the Architectural Committee, in which I am active. Jen Senko and Fiore DeRosa were on a panel and showed the film. They said they actually started out to make a nostalgia piece. Someone they knew was losing his apartment because of development, and he was sad, so they thought they'd film about him and his neighbors. 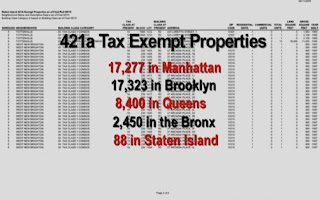 But then they discovered that people were losing their homes because of development all over New York City, and they started to see that Mayor Bloomberg was turning the city into a "luxury product" by driving away the people who have spent their lives here. How to combat Bloomberg-style development? Jen and Fiore are filmmakers, and they do not propose a solution. But I find it frustrating that while industrial policy and real estate development play such important roles in the life of the city, no mayor is ever elected on the strength of his views on manufacturing or real estate development. Litigation does not usually work, either, and it is exhausting and expensive. Awareness is the first step. With "The Vanishing City," Jen Senko and Fiore DeRosa make a splendid contribution to building citizen awareness. Thank you so much for writing about our film. I apologize on behalf of my co-director and myself for not thanking you sooner. This was such an in depth and insightful review of our film. I thank you also for your posts regarding this subject. If people are interested in arranging a screening in their home or elsewhere they can contact us via our website: www.thevanishingcity.com. It has our email address. They can let us know if they want to be on our email list where we let people know about upcoming screenings or other related events. We may be screening at the Municipal Art Society soon. People may also buy the film by contacting us. Anyway, thank you for your really great blog and your extensive review of our film! Keep up the great work.